Planning a vacation is not an easy task, as you will want to save as much as possible. It may take up-to months if you do not know where to watch, what offers are there around to make use of and if you can trust a specific vendor. Even after that you might find a better deal and regret paying for a non-refundable deal and ending up with an inferior offer. Here are a couple of basic tips on how to save. 1. Choose where you want to go. My search always starts from understanding how much does it cost to live in the city I want or would like to visi. To do my research I start with either of the websites Expatistan or Numbeo. Both are very good resources and have up-to date information about almost any city. These websites are mostly updated by the locals or people who lived there for a long time, hence are quite accurate. If I have to choose between two cities I would definitely give weight to the one whose cost of living is lower. 2. How you want to get there? If you are going to choose to fly to your destination don’t miss the Google Flights: I have missed a deal once which was almost 40% cheaper, and my only fault was not checking Google Flights first. It’s very intuitive and it will let you know if you can change your dates and save. As google does not get any commissions from the sales the results are fare. 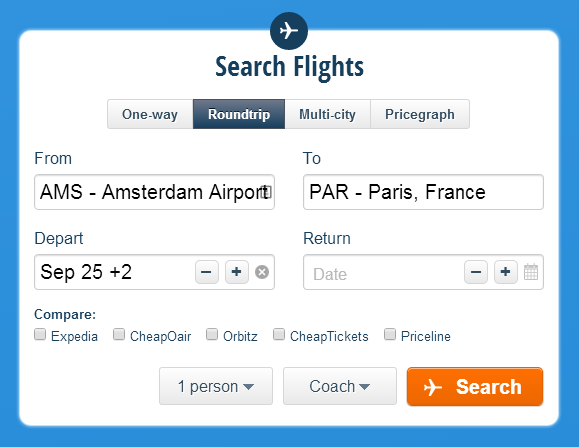 If you do not like the results in Google Flights or you want a "choice" you can choose to try hipmunk.com. You may even choose to compare the results with major OTAs. What many people like most about Hipmunk is the score it features called "agony" which is based on the duration of the flight and the number of stops. If you are going to choose to travel via bus don’t miss the Eurolines.com. 3. Where are you going to stay? Apparently apartments are much cheaper than hotels. You will get a comparable room or apartment for paying much less than you would get staying at a hotel. The vacation rental market has evolved a lot in the past years and there are a lot of independent or corporate rentals all over the world. If you look into staying at independent rentals don’t miss your chance and head to Airbnb or HomeAway. If you are looking for professionally managed short-stay apartments don’t go further, check if Ginosi has apartments in the city you plan to visit. Don’t forget to check the prices for local transport. Google is very helpful, just search for public transport in the city you are going to visit. For taxis see World Taximeter.